Elaine qualified as a solicitor in 2013 having previously obtained a Bachelor of Laws Honours Degree in Law and European Studies from the University of Limerick. Elaine also holds a Diploma in In House Practice from the Law Society of Ireland and has been admitted as a solicitor to practice law in England and Wales. She is a proud alumn of the Washington Ireland Program for Service and Leadership. 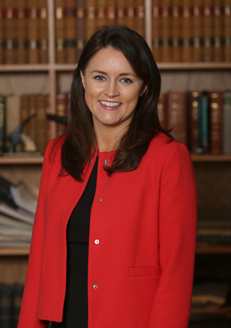 Elaine trained with McGovern Solicitors in Navan and subsequently trained and worked as a solicitor with J.A. Shaw & Company Solicitors in Mullingar for a number of years. Elaine also worked with Rennick Solicitors in Dunboyne before joining Branigan and Matthews in 2017. Elaine has extensive conveyancing experience and advises purchasers and vendors in relation to all aspects of residential and non-residential property transactions. She also acts for clients in relation to personal injuries claims and employment law issues. Elaine has a particular interest in liquor licensing law and has built up a reputation in this niche area. She currently acts for a well-known petrol station company and she travels to District Courts all over Ireland applying for off-licences.